We offer bussing options in both Newmarket and Etobicoke for every camp session. All bussing options are $40 per trip. Please select each time you would like to use the bus. Due to scheduling our Pee Wee programs can only offer one way service on dates that align with other camp drop off and pick up, priced at $40. Taxes are included. North on Hwy 400 to Hwy 11. 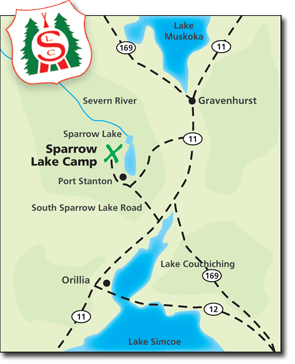 Follow Hwy 11 until approximately 13km north of Orillia. Exit at South Sparrow Lake Road and take your first right to go over the overpass. Turn left at the stop sign and continue West towards Port Stanton. Stay to the left whenever the road forks. Continue until you reach the Camp Gates, located on the right hand side of the road. You will see a white gate and the S.L.C. crest.